The fourth annual MINUS ZERO FESTIVAL—set for April 6, 7 and 8 at Mount Snow Resort in Vermont—has announced its full music lineup for the three-day festival weekend. Headlining this year is ODESZA, Zeds Dead, Claude VonStroke and Tipper with support coming from a wide range of international and northeast regional DJ acts including Rezz, Liquid Stranger, Jai Wolf, Pierce Fulton, GG Magree, Marvel Years, Bleep Bloop, YOOKiE, and many more. Over 50 acts will provide music in different settings including The Barn, MINUS ZERO‘s new indoor stage delivering a proper house music experience at the base of Mount Snow’s slope filled with immersive art curated and hosted by local Vermont collective: Playa Vibes, as well as Incendia, TRIFUCTA, and The Hive. Fresh off their Grammy-nominated album A Moment Apart, ODESZA makes their MINUS ZERO debut as they continue to shine as one of the most sought after live performances in dance music today. Returning for a second year are Canadian production and DJ duo Zeds Dead who have proven to be a dominant force in dance music, headlining festivals worldwide with their electrifying sounds and bone-chilling bass drops. Also performing on the main stage is UltraSloth, the duo project of downtempo favorites kiLL sMTH and Biolumigen. The Barn will be headlined by Dirtybird master Claude VonStroke and joined by Walker & Royce, Love & Logic, and Davidson Ospina. MINUS ZERO truly is a one-of-a-kind festival experience. Set in the beautiful Green Mountains of Vermont, guests can ski and snowboard all day while listening to their favorite artists and then party into the night. On Sunday, MINUS ZERO will be opening the Summit Stage at 6am so guests can welcome the sunrise from 3,500 feet altitude with some melodic beats. 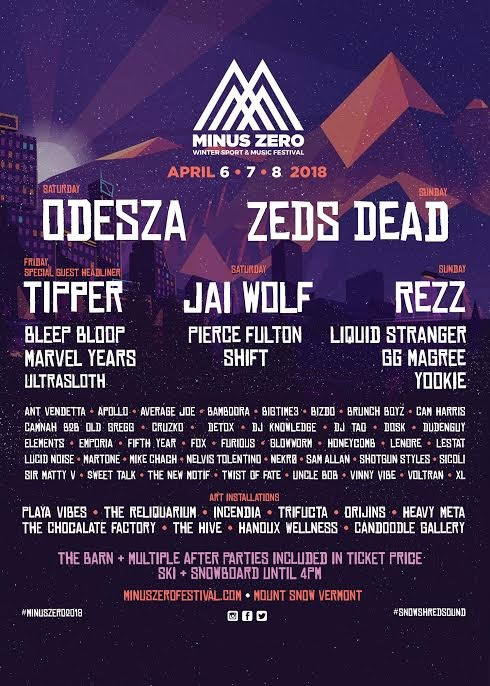 With a total of four stages, and at least two official after-parties each night, the MINUS ZERO experience is not to be missed! In 2017, a sold-out crowd of thousands hit the slopes and partied at MINUS ZERO,which featured over three stages of music from over 50 top international and emerging electronic music acts including Bassnectar, Zeds Dead, GRiZ, Illeniumand Claptone, snowboarding with a Rail Jam & Jump competition and a demo from some of the top pro-boarders including Carinthia Team athletes Nate Haustand Jeremy Ellenberg. At its new home at Mount Snow, MINUS ZERO attendees this year will have access to a larger festival main stage with more views, an indoor heated stage, art installations, more bars and drink stations. Other amenities Mount Snow will provide for MINUS ZERO festival goers includes access to over 5000 hotel rooms in the area with free shuttle buses within the Mountain Zone provided to and from the festival in the Minus Zero Hotel network, indoor and outdoor pools, a wide variety of food and craft vendors and, of course, a multitude of winter sport options with access to 20 lifts and 87 trails. Plus, Mount Snow–located in Southern Vermont and home of Carinthia Parks, known for its premier terrain for snowboarding and skiing–is just a few short hours from New York, Boston and other major northeast area cities.